In the automotive world, attributes most appealing to consumers include looks, performance, fuel economy and a great price. The 2013 Kia Optima sedan possesses all of the above-mentioned items, and it backs the whole shebang with a 10-year/100,000-mile powertrain warranty. Great pick up even on eco. I love how much space I have not only in the front seat, but the back seat as well. When you have a tall family that is one of the first things you look at. I also love the pick up. I thought that getting a hybrid might be sluggish, but I am quite surprised by the amount of speed it has. The controls for the radio and air are very user friendly. The ability to track your eco rating is always cool to see and always challenges me to do better. I like that it keeps track of when you need your next tire rotation and oil change because without it I really would forget all the time. I the only thing I did wish that it had was a setting on the dash that displayed the time, temp and miles left in tank all on the same page. Besides that everyone who has driven my car loves it, including me. The 2013 Kia Optima is a great family car that looks more expensive than it is. This car is great. I love the size and for a larger car still gets great gas mileage. The seats are comfortable and the interior is spacious. The car rides smoothly although road noise can be louder than other cars I have ridden in. The ac in this car is fantastic and the headlights are bright too. The trunk is a great size and the backseat is large enough for two car seats with enough room to lower the middle armrest with cup holders. This car does sit pretty low to the ground so you have to be careful about speed bumps potholes and railroad tracks. I have had my car awhile now and have had no major issues. Automatic traction control can save your life in areas that get snow and ice. So far the thing I dislike the most is road noise inside the car. It's not as bad as some cars but worse than my old vehicle. I bought it used so I'm not sure if it was the previous owners driving or car deficiency but the brakes have already been re done and rotors ground prior to my purchase and now they say they are getting close to needing new brakes. I definitely didn't go thru brakes that fast in my Honda.It's a comfortable ride. The biggest plus's are the fog lights and automatic traction control. The latter saved me form a head on in icy conditions. 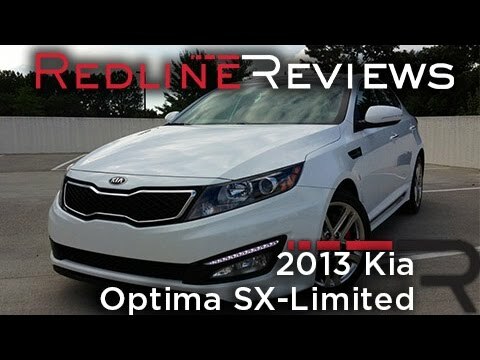 2013 Kia Optima ex review! 55,000 Miles later!